With retirement from farm life looming in our future, We have made the heartwrenching decision in 2014 to reduce our herd size significantly. We have downsized from about 35 goats to 12.. Our favorite goat friends will stay with us as long as possible, as well as the ones who will live out their old age with us. We will continue to breed a small number of very high quality goats for the next few years. Prices generally range from $400.00 to $450.00 for open senior does and doelings. Breeding is an additional fee. Bucklings are rarely available as we routinely wether (neuter) the boys. However, exceptional Bucklings are kept intact and are $500.00 to $600.00 each. The kids are vaccinated with CD&T and disbudded unless otherwise requested. Adult buck prices range from $500.00 to $600.00 each. All registrations and transfer documents are included in the prices. Wethers are $150.00 each and a discount will be applied for two or more wethers. Discounts are available for verified youth projects (4H, FFA, etc), multiple purchases, and repeat customers. We require a $100.00 non-refundable deposit to hold any doe or buck. A $50.00 non-refundable deposit will hold a wether. Once sold, the goat must be picked up or transported within 21 days (three weeks) of the final sale date. 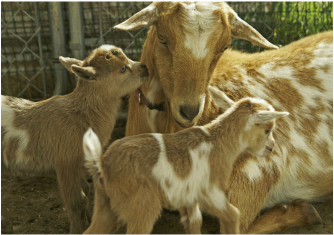 A hold of more than 21 days will result in a $2.50 per day boarding fee for kids and a $3.00 per day boarding fee for adult goats.